The Loire Valley between Sully-sur-Loire and Chalonnes is a cultural landscape symbolic of human interaction with the river Loire. It comprises historic towns and villages, great castles and cultivated lands, mainly tracing back to the Renaissance and the Age of the Enlightenment. The designated area covers a 200km long, thin stretch of land along the river. It includes the towns of Blois, Chinon, Orléans, Saumur and Tours. The site is an extension to the Castle of Chambord, which was already a separate WHS since 1981. This is one of the most recognizable châteaux in the world because of its very distinct French Renaissance architecture. I had been in doubt about doing a proper visit to the Loire Valley, or a quick one so I could take in another WHS (Bourges Cathedral) on the same day. Fortunately I choose quality over quantity, and made the trek from Paris all the way to Chambord, which takes up almost all day by public transport on a Sunday. There is exactly one train-train-bus combination, which got me at Chambord at 11.50 a.m. There are two buses back in the afternoon, plus trains once an hour. 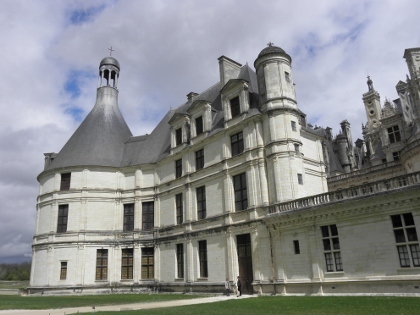 Chambord was the original nominated site in 1981, and is the must visit castle in this area. My bus from Blois drove along the Loire for the first 10 minutes, the first and last look that I would get on that river. It is wide, and its banks are dotted with stately homes and churches. It reminded me of the Upper Middle Rhine Valley, although there the river is less straight and its sides have more cliffs. Arriving at Chambord, the castle almost looks small compared to the surrounding forest. The weather wasn’t that good, so I focused on getting inside the castle. There was quite a long and slow line, not very efficiently run by a site that must see thousands of visitors every day of the year. But after paying 9.5 EUR and picking up an audio guide (5 EUR), I got in and wasn’t bothered by crowds anymore from then on. The Castle’s interior came as a big surprise to me, as I was expecting something like Fontainebleau: a richly decorated palace. Chambord however is almost barren. One enters via a small door, and comes directly face to face with the famous double helix stairway. The whole construction is made out of a light coloured sandstone, which is pretty from the outside but gives it an unfinished look at the inside. The stairway is ingenious of course, and I directly walked up all the way to the roof. There the second main feature of this castle can be found: its numerous turrets. To me this was the most marvellous part of the building. After visiting the other floors and the chapel, I went back to the bus and to Blois. There I had over an hour before my train back to Paris would leave. So I added a quick visit to the town of Blois and its castle. I just walked around, but was able to admire at least some of the colourful decoration of Blois Castle. Although the Loire Valley is most famous for its castles, nature and the beauty of the landscape make up a large part of the outstanding value of this WHS. The Loire is often referred to as the last wild river in Europe, which actually means that it is a free-flowing waters, no dams and locks affect the lower course of the river. However, “wild" was not our predominant impression when we stood on the river banks for the first time, a few kilometres behind Angers. The Loire has a wide bed and flows slowly and smoothly, but carries along large quantities of sand that build up sandbars and displace them again, so that the river constantly changes its appearance. There are only few boats on the river, mainly traditional fishing boats with low draught, no cruise ships and tour boats along the stretch of the WHS. It's a beautiful and scenic landscape, no surprise that the French monarchs built their castles in the Loire Valley. A beautiful river landscape, very good and 'typical French' cuisine, the Château de Chambord - reasons enough to schedule a few days for this WHS. In total, we spent four days in the Loire Valley in August 2015 and we explored the entire stretch of the WHS from Angers to Sully-sur-Loire. We stayed one night in Saumur and three nights in Blois. In particular, Blois was a good choice, it has a charming town centre and we liked it better than Tours or Orleans. Visit the Loire Valley means to visit castles. 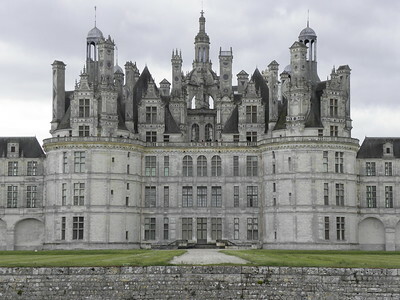 Chambord is a must, but we thought that just one chateaux is not enough to visit this site properly. 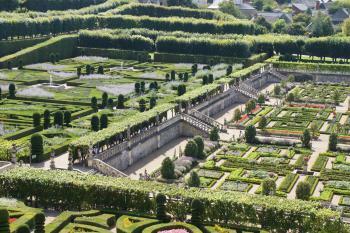 So we also chose Chenonceau, Château de Blois, the Fontevraud Abbey and the Gardens of Villandry. 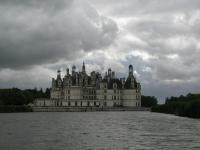 Chambord: an amazing building and well described by other reviewers. Most impressive are the double-helix staircase and the roof. Chenonceaux: an exceptional and elegant architecture, and a beautiful location. Most striking is the gallery that spans the river Cher. It is amazing, that Chenonceau is not included in the WHS. [edit 2018: in 2017 the Château de Chenonceau was included after minor boundary modification]. Villandry was a pleasant surprise. We only visited the beautiful gardens. We enjoyed strolling through the different sections, it was very relaxing. I liked best the sun garden and the kitchen garden. I never thought that onions and cabbage could be arranged in such a decorative manner. The photo shows parts of the ornamental garden and the kitchen garden. 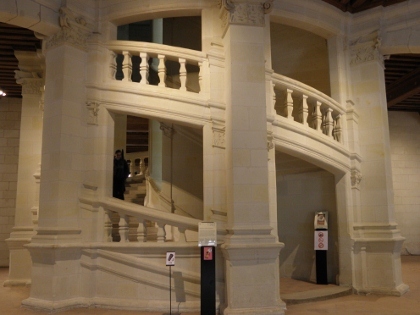 Blois: the best part is the courtyard with the striking open spiral staircase. 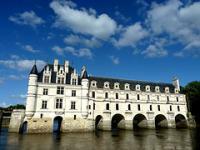 The façades show the architectural styles of the Loire Valley: Gothic, Renaissance and Neo-Classical. The interiors are nice but nothing special, the usual sequence of rooms. Fontevraud Abbey was quite interesting, the tour with audioguide took almost two hours. Fontevraud has an eventful history: once a powerful monastery for both, monks and nuns, under the rule of Napoleon converted into a prison and today a cultural centre and open to visitors. 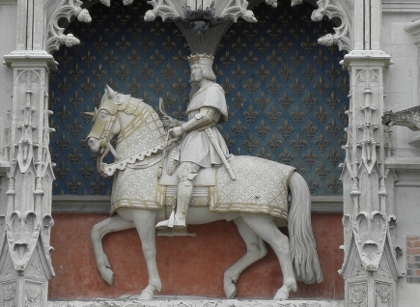 The Abbey is most famous for the recumbent effigies on the Plantagenet tombs. For most of the castles is the ticket office at the outer gate and you have to pay the entrance fee even if you only want to see the inner courtyard. However, some castles can be admired from a distance, Blois, Chinon and Amboise offer nice panoramic views from the opposite bank of the Loire. In Chenonceau it is not possible to catch a glimpse of the castle without paying, the ticket office is at the park entrance, some hundred metres from the castle. In contrast Chambord, admission to the park is free, you can walk around the castle or rent a rowboat, but you have to pay four Euro for parking. Our days at the Loire were calm and relaxing, even though our visit was in high season in late August 2015. But there are plenty of quiet places to enjoy the river landscape, for a walk along the riverbank at twilight or a bike ride. For the most popular castles, Chambord and Chenonceau, I would recommend to visit early in the morning to avoid the crowds. River landscapes have a particular charm and the Loire Valley was a highlight of our trip and is one of my favourite WHS in France. As the other reviewers say, Chambord, Chenoncau and Amboise including Leonardo's house are amazing. In addition, Saumur is especially beautiful from the outside as a classic medieval castle painted in a famous book of hours from the Middle Ages. 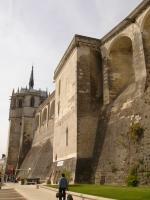 Loches is quite frightening, having been used as a prison after being a fortress. Its medieval town is atmospheric, too. Chinon is made up of the ruins of three castles of Eleqnor of Acquittaine fame that hang gorgeously over the quaint town. There are also fascinating ancient hermit caves at the top of Chinon's hill. Azay le Rideau has a magical atmosphere from the outside, encircled by water. Langeais is beautifully furnished and has a second, older ruined castle worth visiting behind the furnished one. This WHS is a vast valley dotted with castles, forts, chateauxs, cathedrals, vineyards and good food. Perhaps the most visited is Chambord with the double helix stairway. I visited Amboise, Blois, Chenonceau, Azay le rideau, villandry, chaumont sur Loire. The entrance fees are quite expensive but I would suggest visiting different chateaux and not only Chambord, not only to avoid the crowds but also to better grasp the cultural value of this WHS. Chambord - (bus #18 from Blois) a huge but elegant structure set in spacious grounds. The frescoed ceilings were admirable as was the double circular staircase. But most interesting were the multitude of chimneys, turrets, dormers and other rooftop embellishments. Cheverney - (bus #18 from Blois) smaller but equally elegant and a more colourful interior. Some nicely landscaped gardens too. Chinon - (train from Tours) more of a castle than a stately home. Took the lift from the town centre to the upper town and walked around the ramparts to reach the entrance. Great views of the Loire. Azay Le Rideau - (train from Tours) a spartan interior but some interesting paintings and tapestries. Located on an island. 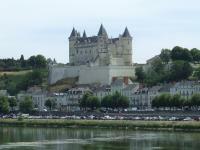 Saumur - (train from Tours, then bus #32 from the town centre up to the chateau) a castle built for defensive purposes. Langeais - (train from Tours) a moat, drawbridge and keep, but very little else. Chaumont - (train to Onzain, then walk across the bridge) an austere looking stately home. Amboise - burial place of Leonardo da Vinci in the St Hubert chapel. The best way to explore the "Val de Loire" is by private car and that's exactly what we did. Renting one from Paris, we spent a day and half exploring the valley. The road signs in France were excellent and it was much less of a hassle than we expected. On the first afternoon, we visited Chambord which turned out to be my favorite chateau in the region. Surrounded by forest, it evokes images from childhood fairy tales. It is simply beautiful. From the top of the chateau, you can really see how isolated the place is. After it closed in the evening, my brother and I spent an hour rowing around the castle (highly recommended, it costed $11 for two) which really enhanced the experience. Any visit to the Loire without Chambord would be a shame. That being said, there are many other places worth visiting in this WHS. After staying in Tours for the night, we visited the ruined castle at Chinon and Fontevraud Abbey, which contains several royals tombs such as Henry II of England and his wife Eleanor of Aquitaine among several others, for the morning. In the afternoon, we visited Amboise and Blois. Frederik Dawson has done a great job of describing the former so I don't think I need to go any further on that. Blois, on the other hand, is a nice chateau from the outside but I wouldn't recommend visiting the interior. Most of it is 19th century restoration and I was slightly disappointed with my visit especially considering that it was our last one before heading back to the French capital. The Loire Valley is a French treasure not to be missed. I visited many other places in this WHS-rich country and it still remains one of my favourite places in France. Watching the film Da Vinci’s Code made my Asian friends came to Europe to see all places, which related to Leonardo’s life. After their Leonardian pilgrimage in Italy, they came to Holland for tulip fields and invited me to join their trip to France’s famous Loire Valley. An offer I hardly refused as I wanted to see another world heritage site. As the trip was mainly about Da Vinci, our destination was Amboise, the last home of this influential man. Amboise is a very beautiful town on the banks of the Loire with many pretty houses decorated with many flowers. The view from the north bank toward the south side is unbelievable as the beautifully chateau d’ Amboise perched on the hill above the whole town like a fairly tale. The exterior of the chateau is really nice and the interior also lovely with acceptable amount of furniture and interesting history. It is important to note that Chateau d’ Amboise is the first renaissance style chateau in France, so this place is quite important for architectural history. The Chateau also has lovely French style garden and nice chapel. This chapel was the main reason for this trip as the remains of Da Vinci were supposed to be here. The tomb of Da Vinci is just a plain white marble on the floor of the Chapel with some inscription, but for the fans’ emotion (my friends) this place was quite overwhelming. Not only the chateau that has link with Da Vinci, the manor name Le Clos Lucé near Amboise town centre was his home until his last day. This manor has nice museum and large park with many reconstructed Da Vinci’s inventions. My friends and I played all these replicas with great fun and we were amazed by the genius of Da Vinci. As my friends are great fans of this man, their enthusiasm to explain everything made this trip became really fun and opened my eye on this region. I really want to come back again to this great place in the near future. There are, as far as I can see, four cultural landscapes in Europe featuring river valleys, and I'd say the most famous is the Loire Valley (the others are the Rhine Valley in Germany, the Danube Valley in Austria, and the Douro Valley in Portugal). An incredible mixture of history, architecture, and culture, it is worth visiting for any number of reasons, but the chateaux certainly beat all the others. They are all masterpieces of Renaissance (and partly Baroque) architecture, especially the famous castles of Chenonceaux and Chambord (the most beautiful of them, with the famous double staircase by da Vinci). Together with great historic cities such as Angers, Tours, Blois, and especially Orléans, the Loire Valley captures the essence of French history and culture and is definitely worth a visit (more visits really). In 1999, rented a car with friends and toured around the Loire Valley as a day trip from Paris. Visited the main attractions (Chambord and Chenonceau) along with some lesser known chateaux. The views, both architectural and pastoral, were wonderful, but I think the highlight of the trip was enjoying several bottles of the local Sancerre wine over a lengthy lunch. Was certainly a worthwhile excursion. Inscribed as "Chambord". Later replaced by Loire Valley. Double Helix: "Chambord is centred on a wonderful double helix spiral staircase." Linear inscriptions: described as "a 200-km linear cultural landscape along the Loire River between Maine and Sully-sur-Loire"
Historical Graffiti: At Chambord: names and dates, boats. Includes inscriptions made by the poet Jean de La Fontaine (1621-1695) and the writer Victor Hugo (1802-1885). Leonardo da Vinci: Chambord: "There are suggestions that Leonardo da Vinci may have designed the staircase, but this has not been confirmed." (wiki); Was buried in the castle of Amboise and lived in the castle Clos-Luc. Painted by JMW Turner: "Vue Sud-Est de Beaugency c1826-30"
Undergoing Restoration or Repair: The Château d'Azay-le-Rideau is currently enclosed by scaffolding during restoration that started in 2015 and is expected to be completed in 2018. There is an interactive website in English, French, and Spanish detailing the work that is being done. 323 Community Members have visited.